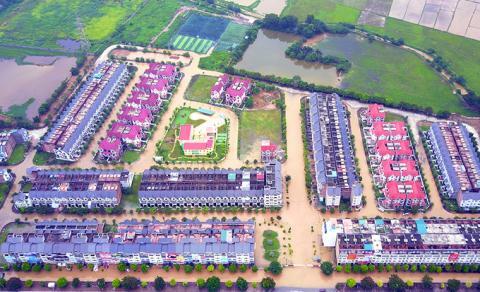 When will Hanoi escape from floods? VietNamNet Bridge - Hanoi’s urban areas have been developing rapidly, but 70 percent of the drainage system was built in the previous century. The aim of eradicating floods by 2020 appears to be an unrealistic goal. According to the Hanoi Construction Department, with the current drainage system, if it rains for two hours with the rainfall of 50-100 mm, 18 streets and 170 spots will be inundated, though the huge drainage system project, capitalized at $500 million, has been put into operation. Truong Van Quang, former Deputy Director of the National Institute for Urban and Rural Planning, said the project only can partially solve the problems of Hanoi, affirming that the delay of the plan is just one of the reasons why the project cannot meet the requirements. During its process of development over many years, Hanoi cannot preserve the natural drainage basins, while the area of rivers and lakes has been reduced. The concretization rate on natural area has been increasing, while the volume of waste water is on the rise due to the increase in population size, production and consumption scale. During its process of development over many years, Hanoi cannot preserve the natural drainage basins, while the area of rivers and lakes has been reduced. Dai Doan Ket cited a report as showing that in 1995, Vietnam had 2,100 hectares of surface area of ponds and lakes. Meanwhile, the figure fell to 1,165 hectares in 2016, with 50 percent of the surface area lost. In the last 20 years, 17 lakes have been filled up, while only seven new lakes have been set up with the area just equal to one-fifth of the area of the disappeared lakes. There are now 112 lakes in the city. Tay Ho district is the locality which has the largest surface area of ponds and lakes in the city (accounting for 79 percent of total surface area). However, the area has decreased by 28,000 square meters since 2010. The West Lake, in 1980s, covered an area of 600 hectares, but it covers 527.7 hectares only, with 80 hectares lost. One fourth of the area of Truc Bach Lake has been lost. In Dong Da, the district with the highest number of lakes and ponds (over 30), has also seen the surface area cut by 15,000 square meters. The Linh Dam Lake has seen the area shrink by half after three years of urbanization. According to Trinh Ngoc Son from the Hanoi Drainage Company, since 1995, Hanoi has been implementing many drainage projects, but these have not helped much. The problem is that since the lakes and ponds have narrowed, the city has lost an important drainage channel. When developing large urban areas, investors ‘forget’ to build proportionally large drainage systems. Ha Dong district is a typical example.